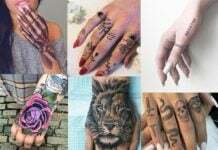 The permanent nature of tattoos means that many people try to make them as meaningful as possible. 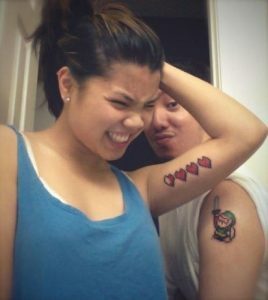 One easy way to make tattoos even more significant, is to get one with a loved one, specifically, your significant other. 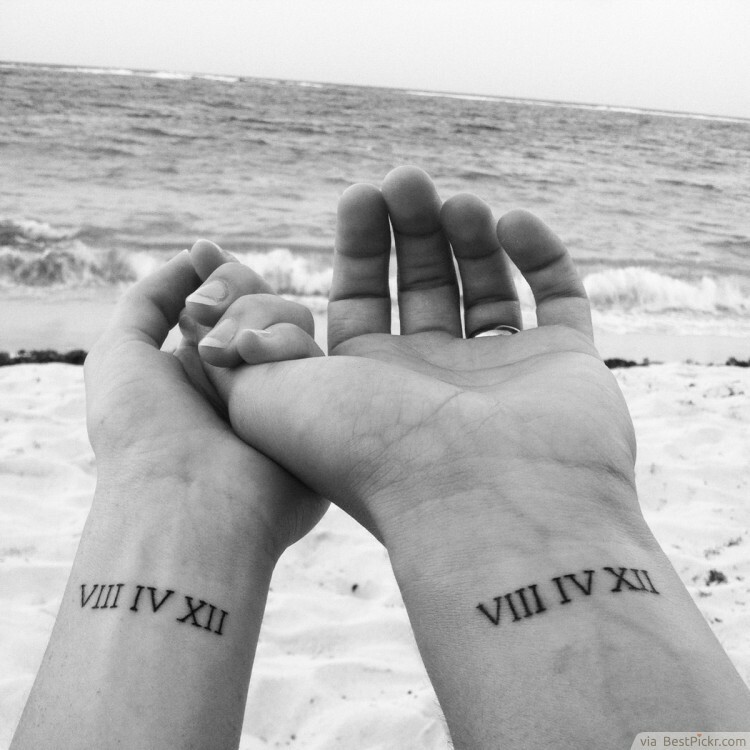 Enjoy these tattoos for couples suggestions that will hopefully spark some ideas for your own special couple tattoo! They range from the cute to the quirky to the beautiful and inspiring. Subtle yet unique, this tattoo is both aesthetically and symbolically pleasing. 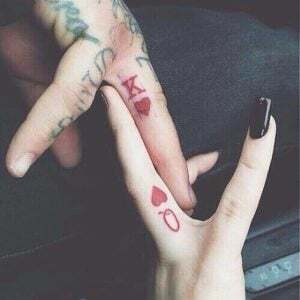 It shows that you are the “king and queen” of each other’s lives. The suits are a classic and easily recognized symbol that translate well to ink. Sometimes less is truly more. This simple heart design is unobtrusive and minimal, yet endearingly sweet when put together. It evokes the nostalgia of childhood where you would scrawl hearts all over your notebook. 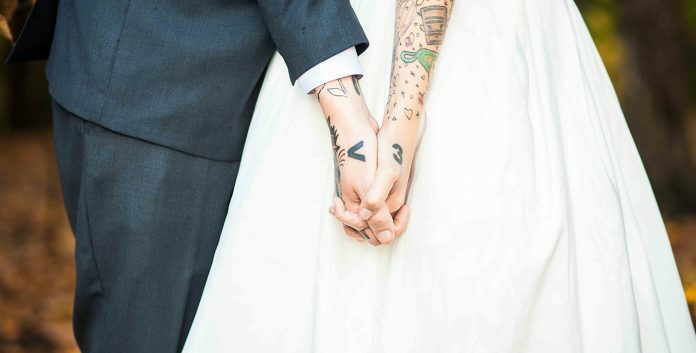 Diamonds might be a girl’s best friends, but wedding band tattoos are forever and they’re literally a part of you. Go the unconventional route and get a ring that is permanently etched on your finger, in place of a wedding ring (or a couple ring!). Bonus — you can design your perfect ring, easily. No need to hunt for one in jewelry stores! Does your significant other hold the key to your heart? 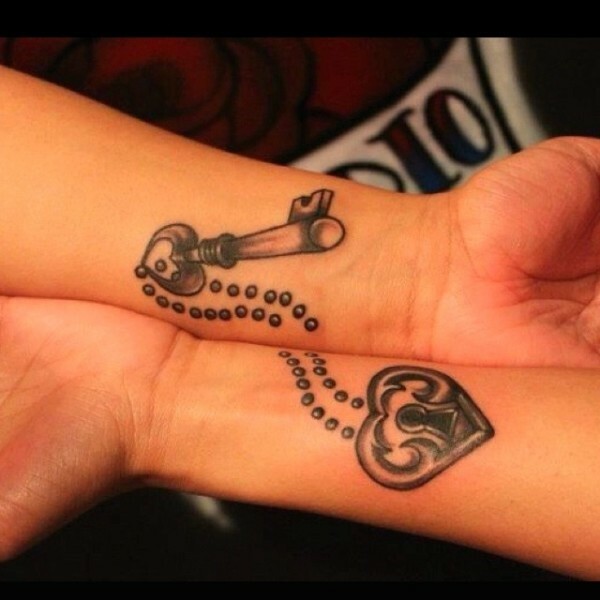 Showcase the unique role that your boyfriend or girlfriend holds in your life with this imaginative rendering of a lock and key. Put your unique touches on it by designing a special lock and key, like this heart one! 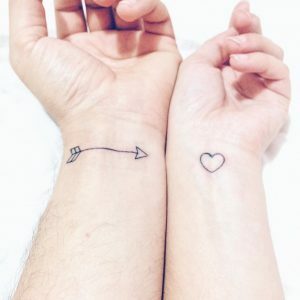 If you’ve been struck by Cupid’s arrow, this is the tattoo for you! Symbolize your lovestruck, “head over heels” state with a simple arrow and heart. They work well as stand-alone pieces and aren’t as obviously matching. If you want something that doesn’t scream love or couple, try a more artistic design like these colored origami cranes. They’re beautiful and eye-catching by themselves, and the different colors provide a nice contrast. 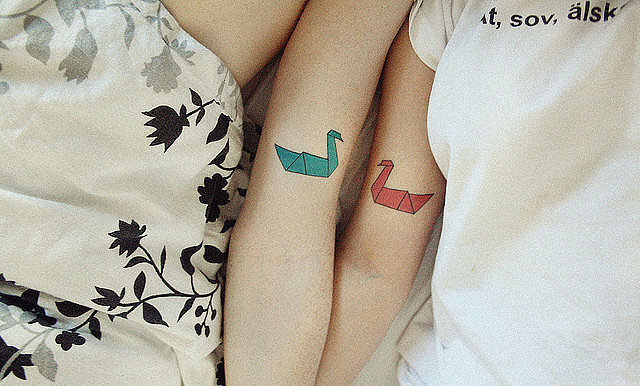 We love this playful interpretation of the age-old adage, “opposites attract”. Are you and your significant other so different yet perfect for each other in the best ways? Celebrate your differences with a symbolic plus and minus sign. Yin and Yang is a beautiful symbol of how opposite forces are actually complementary and interdependent. This makes them perfect images for two people who come together and balance each other, even with their differences. Every couple wants to fit together perfectly, like puzzle pieces that were made for each other. 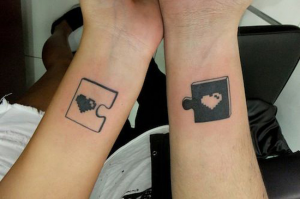 Put your own spin on a classic couple tattoo by designing your own unique puzzle pieces with different colors and prints! Birds are a lovely symbol of freedom. With these two trails of flying birds, you can show off your individuality by making the birds slightly different. 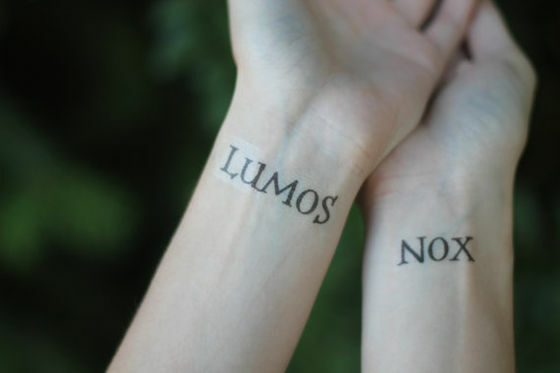 Bonus – this tattoo unlocks its full potential when you are holding hands… perfection! 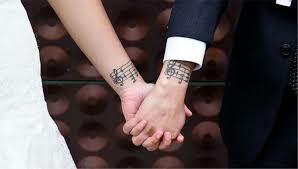 If you liked our tattoo wedding rings idea, this one is also a cute tattoo idea for couples! 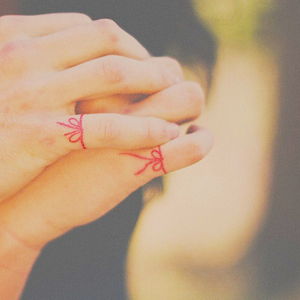 Japanese and Chinese legends talk about a red string of fate that gods tie around the fingers of soulmates, to connect them to each other. These strings may stretch or tangle, but they’ll never break, as they connect destined lovers. 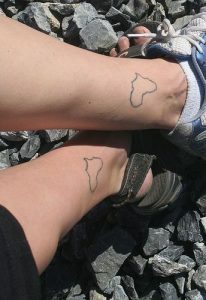 Turn your body into an atlas for the people and places you love with this geography-centred tattoo. If you and your significant other met in a specific place, get a tattoo of the country’s shape. Perfect for fellow travelers! 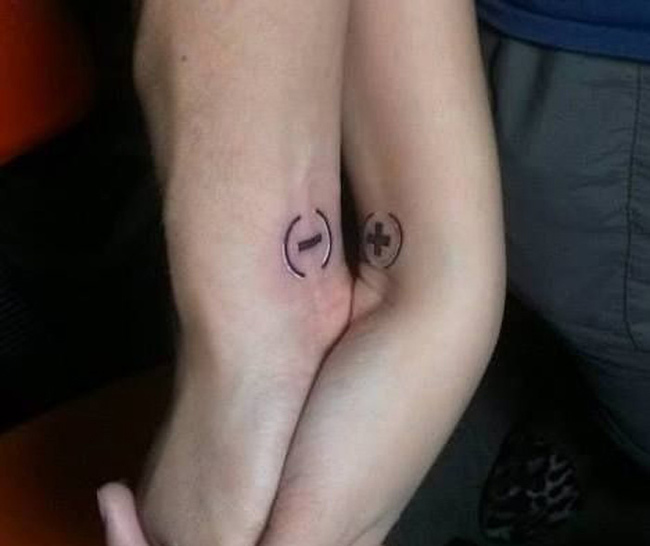 Part of what makes couple tattoos special is that they are unique to you. 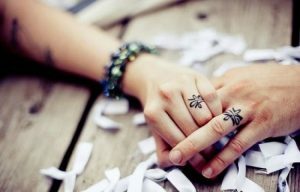 To make them extra special, find one that symbolizes your common interests. For instance, these matching Legend of Zelda tattoos are quirky and super personalized! Quotes are a lovely way to convey a sentiment, especially for bookworms! This one is from a poem by Anne Bradstreet and says “if ever two were one, then surely we”. Celebrate your favorite fandoms together! 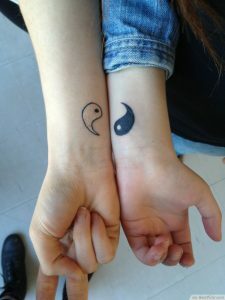 This tattoo plays on the theme of night and day, yin and yang, opposites attracting, with a clever reference to the Harry Potter series. 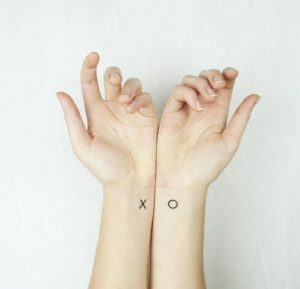 Xs and Os are one of the most recognizable ways to symbolize hugs and kisses. 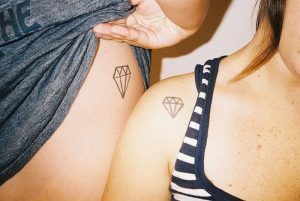 These understated tattoos look great on their own and are the perfect choice for those who want something minimal and standalone. Even non mathematicians can understand the breathtaking nature of infinity! 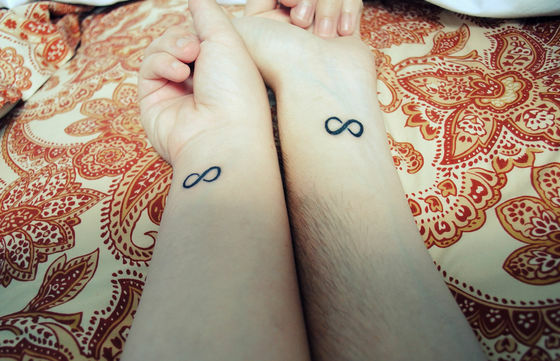 If you and your significant other are committed to each other forever, capture that hope for longevity with this simple symbol. This is one of our favorite marriage tattoos! Commemorate a special date in your relationship history with these classic roman numeral tattoos. It can be the day you met, an anniversary or even your wedding date! Find something special that only you two share. Matching symbols are a simple yet powerful statement. 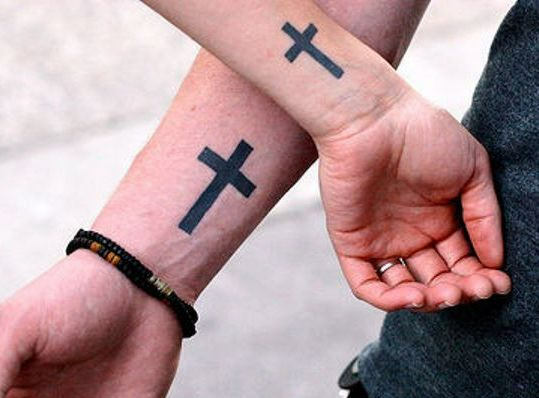 These crosses can be a perfect way to showcase a shared religion, or just a proclivity toward certain symbols. We love how these are different sizes, which add a fun spin. Anchors are a beautiful nautical symbol that stand for the stabilizing effect loved ones can have on you and your life. 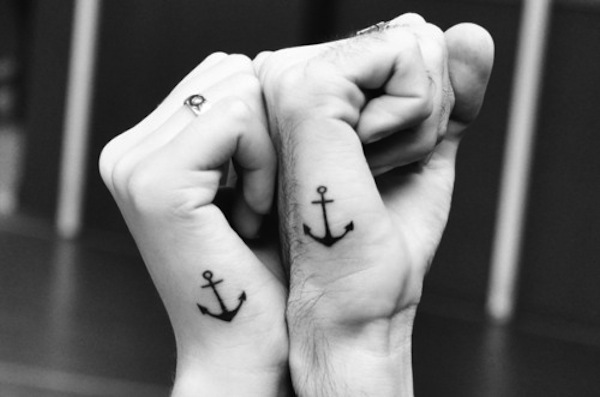 These matching anchors are a nice way to show each other that you will be there for one another and keep each other grounded. 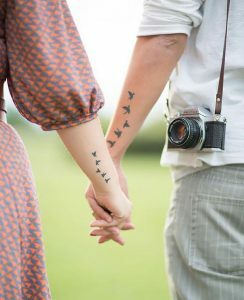 If you share a passion or hobby, celebrate your love for it and each other with matching tattoos! Maybe you are professional musicians or just avid music fans. Whatever the connection, pick something that uniquely captures something that you two share. These matching avocado halves are a familiar sight for any guacamole lover, but more importantly, they’re a stylized and unique take to the puzzle piece theme. 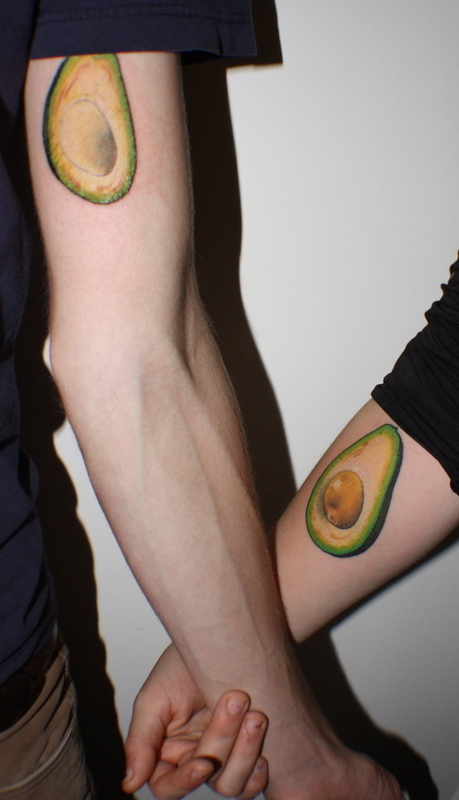 You guys are the perfect fit, just like…two halves of an avocado. Your love is eternal, so what better way to symbolize it than with diamonds? After all, diamonds are forever! This is a pretty standalone piece that will also play nice with other tattoos, perfect for those who are looking to get an entire sleeve. Calling all foodies! 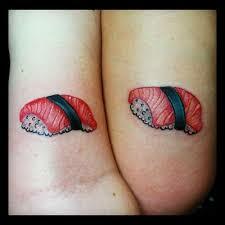 If you’re looking for something a bit on the goofy side, try a food tattoo like this adorable sushi one. 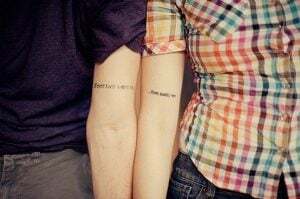 So if you’re looking for really cute cute couple tattoos, it’s cute, funny and not easily forgotten. 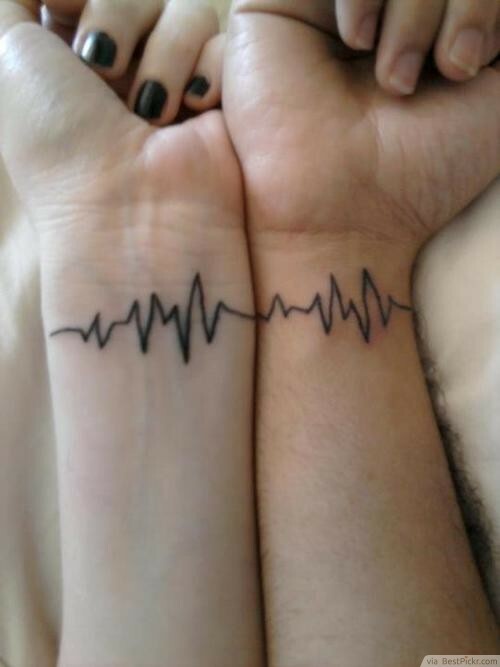 For the ultimate personalized tattoo, get your significant other’s heartbeat sketched on your body. You’ll literally be able to carry a part of the other person with you at all times. We hope you’ve found some inspiration in our couples tattoos list!